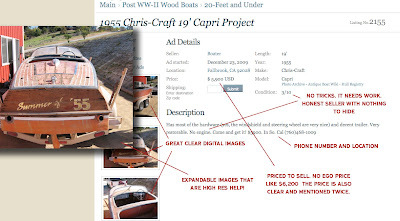 Sell Your Classic Boat Stuff For Free… But Do It Right. One real nice resource out there is the Trading Dock. Created by Bill Basler of the Chris-Craft Antique Boat Club, you can list your boat or boat related stuff and see what happens. The Trading Dock started in a print format as the classified section in the Brass Bell. BUT, that was print… and now its web… so if you are going to sell something on your own, do it right and know the difference between formats. Two listings this week are perfect examples of a right way and a wrong way. The Right Way. This ad is clear and tells you the story as completely as one should want in an ad. Not to much to scare one away, and not to little to confuse you. Photo’s photo’s photo’s, We use the web for gathering information. Words are one thing and can be used cleverly, but unretouched straight forward images can tell the story much quicker. The highest quality you can muster up and lots of them. The price is a good price, but is clearly priced to sell. $5,999 sounds a lot more affordable than $6,000, yes I know it’s one dollar, but it’s all about motivation through what you put in your ad. This ad also has not tricks in it to make you call. So I know I am dealing with someone I can trust. All this in one quick glimpse. Another huge positive on this ad, is email. I got an email from the seller last night at 11:45 telling about the boat and with a link… So reach out. Send folks to your ad. Its all free and you have just doubled your exposure. Also make sure you send the email to publications like mine so I might do a story on it and double your double exposure with that. That is what is called social marketing. You are socializing your boat. It works and is putting traditional ad agencies and newspapers out of business faster than any rescission could. How not to do it. Or what you can improve on. I hate to pick on one ad, because in this hobby there are tons of them and this seller does not deserve this sort of exposure not to mention that the seller is most likly a very nice gentleman that is a great guy…. But these two ads are right next to each other on the trading dock and just popped out at me. It’s what motivated the story. So what s this ad telling the reader? The first thing is that the seller just wants to get rid of the thing, and does not even have the energy to take a photo. It also says that he does not really care what the price is. Since clearly there is more than $1,000 in the boat. It’s the kind of price that says. You know what it’s worth, I know what it’s worth, but just get the dam thing out of here. A $5 adjustment would show motivation. No images not only show a lack of effort, on this boat not many folks know what the maker is, so you have just left out the majority of the viewers from your target. These boats are all image, it’s emotion that sells a boat. The description at the top is written in a way that this is the only project boat out there. Now I know there is a philosophy about this sort of ad. It generates contact. I get that. I deal with 30 car dealers at my agency. I know all the tricks. This one used to work in Newspaper classified because there was no real capability to show an image, the call is refereed to as an “UP” As one dealer said, “just make the phone ring, I can take it from there”. That dealer is at the bottom of the sales heap this year… and last year. We know for a fact that when folks search for a item on the web, they are doing it to gather information in a fast and trustworthy manner. Over 85% of car purchases start with the web site. And nothing sells with out an image. These classic boats are even more image driven. Now, to be fair, and I want to be, this ad did make me click on it, because it was so blind, and I did google a Hiliner boat and found a cool one at the Antique Boat Center with images in Maine as well. So what happened here? 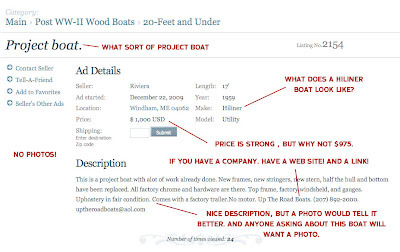 Up the road boats ad on Trading Dock just drove traffic to a competing boat for sale! And I did a link on it… all while I am pointing out the flaws in the ad… That’s having social marketing work in a bad way for your sale. My point is not to single out this ad or seller, it’s to help folks out there market there boats better. And to use the tools that are out there that are free, and guide you through the pit falls.If you click on the images they will take you to the ads. I hope they both sell… If Up The Road Boats wants I will do a story on this boat to make up for this. As I said. We just want to help. Earthquakes, Hurricanes, Nothing Compare's To The Destruction From Googlebots..